Logos Bible Software 8 review: Do you REALLY need it? I often get emails and comments about the tools I use for Bible study, and I need to give credit where it’s due. I couldn’t do this kind of stuff without Logos Bible Software. I use Logos for every Bible-y thing I do—whether it’s a blog post, a whiteboard video, or my own personal Bible study. A lot of research goes into this site, and without Logos Bible Software, it would be way out of my league. I’ve been using this product since version 4, and I’ve yet to find a better, cooler, higher-tech tool for this kind of stuff—it’s the Batmobile of Bible study. I know a lot of you Bible geeks are doing similar Bible studies yourselves, so there’s a good chance you’ve heard of Logos. I just want to give you my take on it. It has its pros and cons, but overall, I’m really happy with Logos Bible Software. How about a tour of Logos? Before I launch into a full-on review of this Bible software, let me get a few things out of the way. I hate fine print, so I’m telling you up front: I’m an affiliate of Logos, and I’ve received advance copies of Logos 6, 7, and 8 to try out. If you decide it’s right for you based on my recommendation, they give me a kickback. Logos Bible Software isn’t for everyone. Like the Batmobile, it’s too expensive and high-tech for most people. But if it is for you, I can get you a sweet discount. It’s hard to imagine a Bible geek not loving this tool. Like I said, it’s the coolest gadget I own. But remember: I’m calling Logos Bible Software the Batmobile of Bible study—not the Batman. Why? Because like the Batmobile, Logos is a force multiplier. With Bruce Wayne in the driver’s seat, the Dark Knight covers more ground and stops more bad guys. But if you put an average Gotham citizen behind the Batmobile’s wheel, he’s not going to solve any crime. In fact, he’ll have a hard enough time just starting the thing. So if you’re going to drive the Bible-study Batmobile, make sure you’re willing to play the Bible-study Batman. You get out what you put in—which means you have to invest time in learning the software, learning the lingo, and learning the Scriptures in order to make this investment pay off. And boy does it pay off. I’m going to walk you through some of my favorite aspects of Logos Bible Software, but first, I wanted to share a flow chart with you. It will walk you through a few questions that I’ve asked people who were considering whether or not they should purchase Logos. Keep these questions in mind as you’re reading my thoughts on Logos. What’s new in Logos 8? Let’s work through the pros first, beginning with a few awesome new capabilities they’ve added to their eighth version. You already know I’m bullish on the platform—there’s no way I could run this blog without it. All these features are included in the Silver level and higher. The main complaint that I’ve heard about Logos over the years (aside from price) is that it’s difficult to use. I can think of at least three entire businesses that exist specifically to help people understand how the h*kk to use Logos Bible Software. That’s because although Logos has some phenomenal capabilities, it’s not the most intuitive tool to get the hang of. 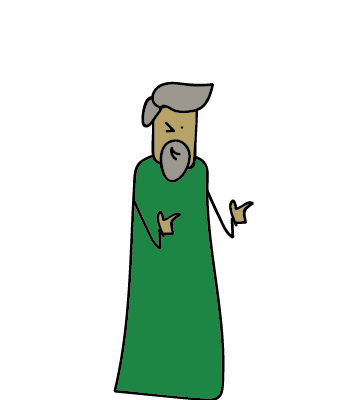 It was kind of like putting Joseph of Nazareth (a first-century carpenter) in a modern, state-of-the-art workshop. It doesn’t matter how skilled he is: those advanced tools aren’t going to do him any good if he doesn’t know how to use them! That’s how a lot of Bible geeks felt when they tried using Logos in the past. Well, Logos has become a lot easier, thanks to their new workflows. Essentially, now the software guides you through Bible study itself. Just put in a passage, a topic, a biblical person, or a biblical place, and Logos shows you how to study it. It’s really, really smart, because you’re not just learning about the tools—you’re discovering more about the Bible by using the tools. For example, let’s say I wanted to know a little bit more about those Nephilim in Genesis 6. Are they half-demon giants? Just power-hungry humans? All I need to do is put the Bible reference in there, and Logos 8’s workflows give me step-by-step instructions for exploring that difficult passage. This is a HUGE step up from every previous version of Logos Bible Software. Logos comes in base packages, with are groups of features and libraries. 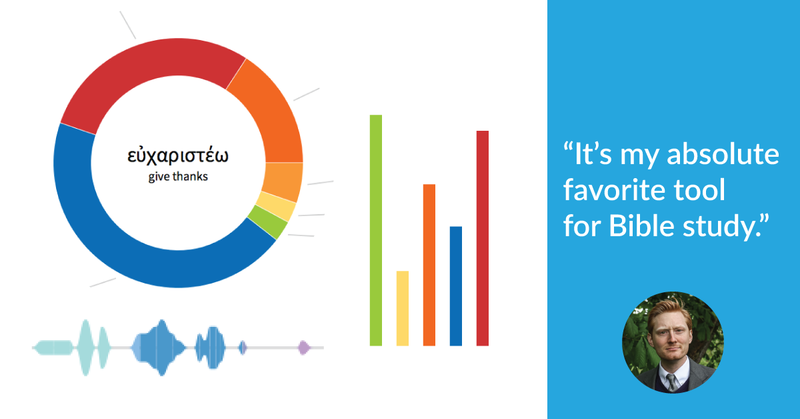 Features are the powerful tools and datasets that Logos is built on. Libraries are the resources that you use Logos to access. It includes your Bibles, commentaries, interactive charts, and more. People have been asking me for years which package they should get in order to do better Bible study, and for years, it’s been a tough call to make. To get all the features and a decent library, you had to spend around $1,500. If you were to purchase all these separately, you’d pay almost $450! 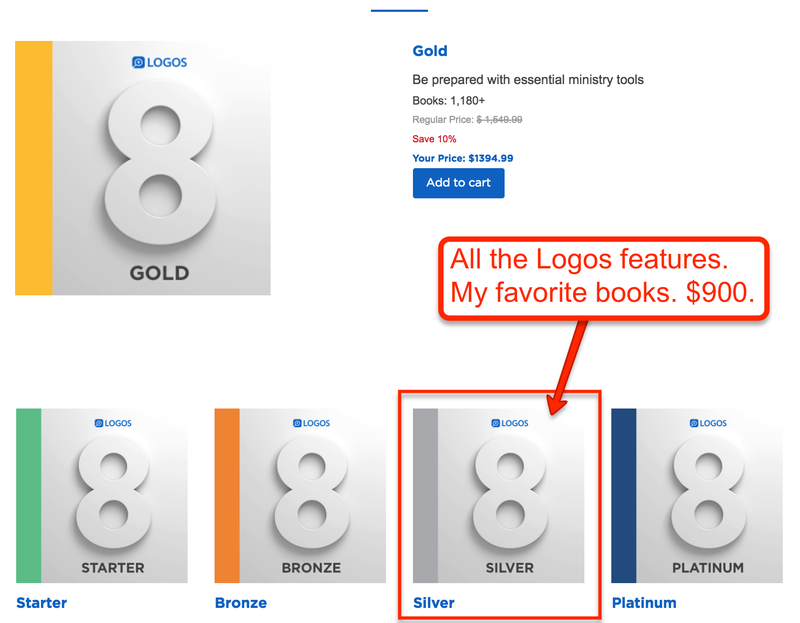 But Silver gives you all of Logos’ features, these four gems, and 300 more books for about $900 (provided you use my discount). Granted, Gold has a lot of good resources for exploring church history. It has more commentaries and lots of writings from the church fathers. But if you just want to do awesome Bible study, Silver is what you need. 3. Logos 8 helps both scholars and amateurs (like me). When I first tried to use Logos, it was in its third version. Back then, the tools were more useful for the seminarians than they were for people like me. But with every update, Logos makes it easier for people like me to get into the text and pick up on stuff that would otherwise be lost on me. The tools have taken on a more this-is-for-everyone feel: you don’t need to be up on all the seminary lingo to get a lot of use out of the tool. What can you do with Logos Bible Software? You’ve seen the things I love about Logos’ latest version. But I’ll level with you: Logos has been awesome for a long, long time. I’m going to show you just what kind of Bible-study superpowers Logos Bible Software gives you! Logos can (automatically) point out things you’d overlook. I’ll give you that. It is straightforward . . . except when it’s not. I’ve found that setting up a few filters like these help jolt me out of my cultural understanding of familiar parts of the Bible. For example, we’re used to hearing that the Great Commission in Matthew 28 is all about Jesus telling us to GO. But when I turn on my Logos visual filter . . .
. . . I see something entirely different. So the imperative verb in the Great Commission is to “make disciples”—that’s not something we would pick up on if we’ve constantly heard a different perspective on the verse. And it’s not something I would have thought to look up on my own. But When I set up that filter in Logos Bible Software, the technology points it out for me. In a way, it’s like I have a Bible scholar pointing out cool things that I’d overlook—and not in an interruptive way, either. But wait … it gets even better. 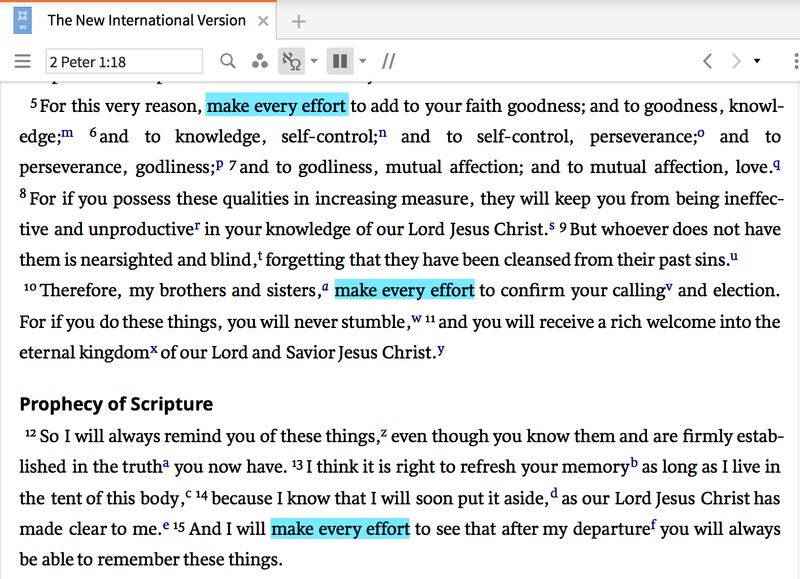 I could jut go through this book, highlighting “make every effort” every time it appears, looking up the Greek word, making some notes, and calling it a day. But just like that, you can tell Logos to catch key related words that would otherwise slip right past you! But the good folks at Faithlife put together a tool that lets you browse the New Testament for uses of the Old Testament. That means if I want to find every time the book of Isaiah is quoted in the New Testament, I just open the new tool (very creatively titled “New Testament Use of the Old Testament”) and select “Quotation” as the “Type” of use I want to look up. And just like that, Logos gives me a report of every time the book of Isaiah is directly quoted in the New Testament! Logos shows how any word is used across the whole Bible. 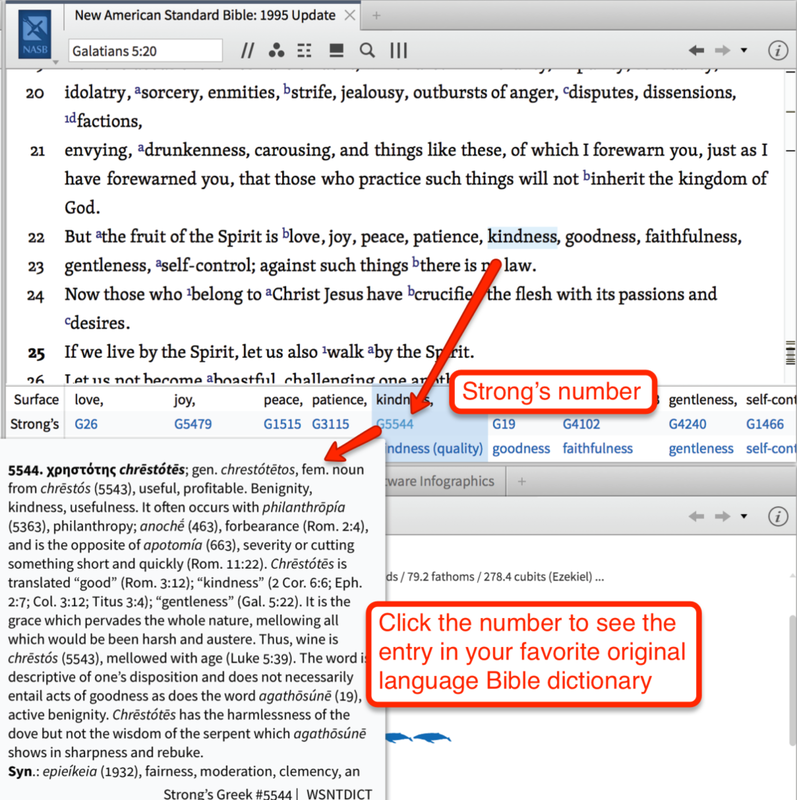 Logos calls it Morph Search, and it’s hands-down the most useful feature of this Bible software. There are few times I use Logos without putting this tool to work for me. It lets me search the Bible for any Greek or Hebrew word, which is super helpful. For example, have you ever seen my list of all the one-another commands in the New Testament? I made that list in MINUTES. I followed a few simple steps. I started with a one-another command I knew, and then a few clicks did most of the work for me after that. That gave me a huge dump of every time the Greek word for “one another” is used in the Bible, which I was able to go through and categorize. And here’s what’s crazy: Logos Bible Software has been doing this since 2010! It’s a feature from way back in their fourth version. You can run a background check on any Bible character. The Bible Factbook really gives me a hand. It pulls up any media in my library on Ezra. It pulls in the biblical events Ezra takes part in. It shows me the Bible dictionary articles on Ezra. It shows me how the Bible refers to Ezra (even when it’s just pronouns like “he” or “him”). That’s just skimming the surface, folks. It also pulls up a timeline for the character, a list of relatives, and links to further explore his roles and the like. This is a huge, huge step up from the “Bible Facts” feature they rolled out with the earlier version. I finally feel like I can look up any biblical figure, place, or thing and find everything related to that person. I think of it like a meta-encyclopedia to the Bible: it gives me a high-level look at the people (or whatever) in question, then gives me lots of links to explore. Then, I’d find the mention of “kindness” in Galatians 5:22 and make a note of the Strong’s number next to it. The next step would be to flip to the back of the book to find the corresponding number. There, I would find a quick, dictionary-type definition of the word. If I wanted to know more—and I always did—I would look up that word in Dr. Spiros Zodhiates’ Complete Word Study Dictionary: New Testament for a full explanation. But with Logos, I don’t have to do that. You can search the Bible by speaker in Logos Bible Software. I don’t know of any tool that lets you pull this off besides Logos. Suppose you want to find all the places where God talks about David. You can’t just search the Bible for the words “God” and “David.” That would leave out some important synonyms (Lord) and pronouns (he, him). Plus, even if you generated a list of all the times God and David are referred to in the Bible, you’d have to sort through the results to see which verses actually involve God speaking about David. That would take DAYS to do by myself. Sheesh—it’d even take days to do with the old Logos 6. But I did that in about 15 seconds with Logos just now. I kid you not. In fact, you can download the results by clicking here. Plus, I can check to see if any Bible character speaks on a certain topic. That’s pretty cool. You can even browse the whole Bible by the words spoken to God. This gives you a look at every single prayer and petition and conversation directed toward a member of the Trinity. You can search the Bible by sense in Logos Bible Software. This is also super, super exciting. The Logos team has gone through the Bible tagging words with their basic definitions. Now we can finally search the Bible by meaning instead of just by word. Here’s an example: I wrote a post on the angels and demons of the Bible. I could have searched the Bible for “angel,” but that would leave out important words like “cherubim,” “heavenly host,” and “seraphim.” That’s no good—I would have needed to do the tedious work of hunting down all the ways angels are referred to in the Bible. But with Logos, I can just search the Bible for every time the angel sense is used. That pulls up results for “angel,” “cherubim,” “glorious ones,” “watchers,” “archangel” … you get the idea. Logos Bible Software gets us closer to the original settings. Let’s say I were typing up a study guide for the book of 3 John. I could just read the book, do some cross references, and start plugging away at the study. But I’d be missing out on some important pieces of this letter. Since I’m not a first-century Christian in the Roman Empire, I’m blind to a few cultural concepts in the epistle—concepts that people studying 3 John should understand. As you can see, some of these are a lot more helpful than others. “Letter writing” is something we understand pretty well nowadays, but “Elders as fathers” is something I’ll want to write on in that study guide, since it’s how John sees his relationship with Gaius and the church (3 Jn 1, 4). You can probably see how helpful that is to me and Laura as we keep unpacking the books of the Bible in study guides, infographics, and the like. I can also see this being a huge help when it comes to writing sermons, preparing seminary lessons, and the like. With Logos, you can easily visualize ancient units of measurement. Remember the first time you read the story of manna falling from heaven? It’s an amazing miracle that the Lord worked for his people in the wilderness. Sweet-tasting bread just shows up all over the land like snow! Moses tells the people not to gather more than an omer’s worth per person (Ex 16:16). The people who gathered too much just ended up with nasty, wormy mush the next morning. But you know what always bothered me about that passage? When I go to find out just how much an omer is, Moses says, “Now an omer is a tenth of an ephah” (Ex 16:36). But Logos Bible Software’s Weights & Measures Converter makes a lot more sense out of this. I just open the tool, enter “1 omer,” and SHAZAM! So an omer is 1.5 liters, which is a good deal of bread per person, especially if this stuff could be packed down. It’s nice to have this kind of information built into my study tool, because I can immediately get an idea of what the author’s communicating. Let’s try another example. Suppose you’re going to teach about Noah in your church’s children’s ministry this Sunday. (Good on ya!) You just KNOW that one of these curious 7-year-olds is going to ask just how big the ark was . . . and “300 cubits” just isn’t going to cut it. With this tool, you can come up with not just one, but FIVE tangible examples to share with them! 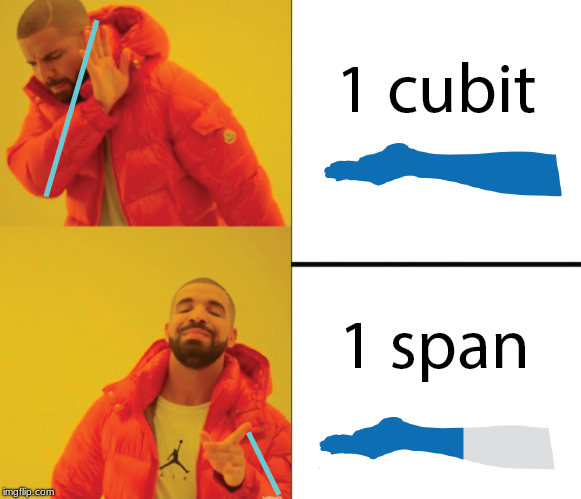 Just type “300 cubits” into the Weights and Measures Converter and you’ll get . 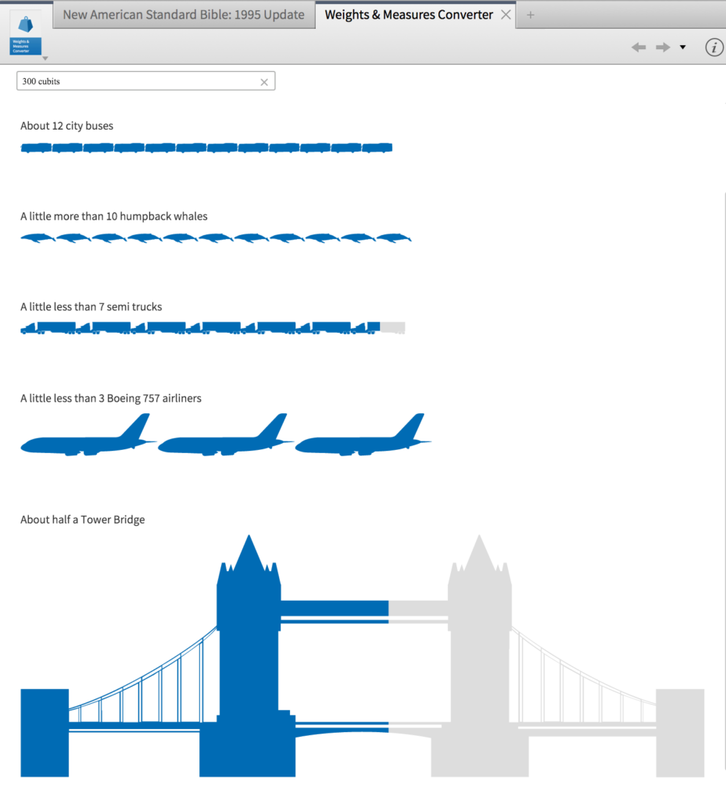 . .
You can get an even more tangible idea of just how massive 300 cubits is—using whales, bridges, airplanes, busses, and semi trucks as reference points. 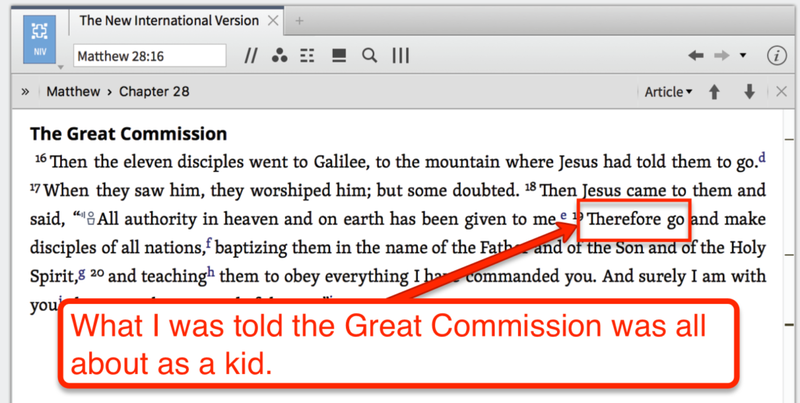 And new versions of Logos Bible Software keep awesome features from before. We can still right-click any word in my Bible to see what the original Greek or Hebrew word is. And we can still immediately find that word’s definition. And we can still search the whole Bible (or just specific books) for places where that word is used. If you’re sold on this tool, you can get it here. They’ll even give you a discount and some free books if you tell them I sent you. Logos is expensive. (Although it’s more affordable than ever.) Seriously: even if you go with the bottom-shelf package, you’ll spend a few hundred bucks. Is it a great deal? Absolutely! But you need to think of this as an industry-grade tool, because that’s the kind of price you’ll be paying. Logos takes time. It’s a force-multiplier: you get out what you put in. This is NOT some theo-magical device that makes the Bible’s most difficult passages become clear. You’ll still need to put in hard work, but the return on that investment is amazingly high. Logos is high-tech. If you have trouble finding your way around a smart phone, you’re gonna have a bad time in Logos 8. It’s got a learning curve that you need to scale first. If you read through all that and you’re still as excited about Logos Bible Software 8 as I am, woohoo! It’s time to set you up with your own base package. And that’s pretty easy. Just go to my page on Logos’ website, choose a base package, and start studying! Thanks, Gabriel! I’m using Logos 6 Gold, which includes all these features. And a word to anyone else snooping the comments: Abram’s review of Logos 6 is super helpful, especially if you’re already familiar with Logos 5. I too would be interested in that affiliate program. I am guessing you got that set up some time back. Actually, I just got it set up in the past few days (though I’m not sure how much good it’s doing me, what with Logos’ website currently down). Well, hey there Josh! You probably don’t remember me, but I’m a friend of Rick Whitaker from First Baptist Church of Moore, Oklahoma. I’ve lost track of you somehow. I hope you are yours are well. Blessings to you. Wow…great overview of the New Logos 6. I’m waiting right now on my resources to download so I can get my hands on it! Can you give some details about your search for when God spoke to David? I refer to the actual query string. This is the first visit to your site, but surely not the last. Great job. 2. Select “Bible” as the type of search. 5. BOOM! You have all the verses that reference David and feature words spoken by God. I feel like I’m a little late to the game… But i’ve tried this search several ways and can’t get it to work. I tired to use the coupon and logos said it was not valid and would not honor it. Pretty disappointing. Odd. I just tried it out in checkout and it works fine. Did you use OVERVIEWBIBLE6 on a transaction including a Logos 6 base package? The coupon’s only good for base packages. I currently own Logos 5 Gold and love it. There really isn’t a cheap upgrade so would you say the upgrade to Logos 6 is worth the steep cost? I tried to find a comparison of the two and maybe didn’t look hard enough but would love your feedback. Thanks. It really depends on what you want to do. If you want a better look at the core structure of certain books and passages, (especially the Psalms and Proverbs), you’ll want to get the Feature Crossgrade (I’m pretty sure my coupon code works on this, too). The team built a really extensive comparison chart of all the packages; you should check that out, as well! I know I’m a few months late, but the discount code no longer works. Might there be one that does? That’s weird: I just tried it out and it worked for me. Logos doesn’t allow you to stack coupons, though, so you may want to make sure there’s not another promotional code active in your shopping cart. You can also use my code when you call sales. Thank you, it does! I already had an Academic Discount, and wanted to see if another would work. But now I know: no stacking. Thanks! It is also worth noting that there are many varieties and “flavors” of Logos. Recently, they rolled out distinctive base packages for many faith traditions, evangelical, Lutheran, Pentacostal, etc. There has always been a Catholic version, Verbum, http://www.Verbum.com. There’s even a non-religious, humanities platform, Noet, http://www.noet.com. If you join their email lists they will give you free resources through each, monthly, and if you do make a purchase, they will send you a birthday and Christmas card, each year, containing a “no minimum purchase” gift code worth $20, each (they are time limited, however, so you can’t hold onto them and stack them). More important, though, is that Logos also offers a decent _entry_ level platform for the lay masses: The FaithLife Study Bible, FaithLifeBible.com. It features a protestant Bible version, Lexham Engish Bible (LEB), as well as the Lexham Bible Dictionary, lots of photos and infographics, reading plans, and other resources, and group study features. All of the platforms are interchangeable. So content you purchase at Verbum.com can be accessed with the Logos or FaithLife Study Bible software, and the free resources available through the FaithLife Study Bible is accessible through the other platforms: Verbum, etc. I am NOT an affiliate. Been a user of Logos for many years, but I’m guilty of not using it to the best that it can provide. Many years ago when Apple came out with the iPhone, the Bible software did not support it, I wrote them several emails telling them that it would be worth their while to include Apples IOS for their customers who liked the Apple products, they evidentially did not believe me as they were not interested at the time. As a side note several years after that they did make it available for the iPhone and other Apple products. Anyway, I started looking around and since I had already heard of Logos Bible software I gave it a look and have not regretted it. I have it on all my Macbook pros, my iPhone, my iPad, my iPad Air and my iPad mine. It is my go to Bible software, it offers such a wide variety of products to go along with it and is so easy to integrate all the tools. By the way, I did enjoy your review of Lobos 7, I especially liked your flowchart! Hey, David! Fair question, with a few answers. 1. I was paid nothing (up front) for writing this review. I was invited to try Logos 6 in 2014 and Logos 7 in 2016 before they were released, and as far as I know, I was under no obligation to review either. 3. On yet another hand, I’m an affiliate of Logos. So I receive a 20% commission when someone who has never bought a Logos base package before buys one through my coupon code. Curious how the date at the top of the article says Oct 23, 2016, but some comments say they were posted 2 years ago. Did I lose a year-and-a-half of my life somewhere? Jeffrey, nice review. The Batman-Batmobile analogy was especially good, as was the decision flowchart for those considering purchasing. I was wondering if you have any suggestions for improvements for Logos 7? Abram J-K mentioned a few in his Logos 7 review. The main improvement: I’d like easier ways to search by general category of “person/place/thing” using the sense lexicon. For example, I’d like to get an ordered list of Jews mentioned in the Bible by tribe, or a list of weapons mentioned in the Bible, or a list of tools used in the Bible—all based on how many hits Logos turns up. When you wrote this info in 2016 – what version of Logos gives the details that you referenced? I’m a Sunday School teacher and hopeful that the “bronze package” would give similar breakdowns and examples. Please advise. I’m on Logos 7 Diamond. But Bronze has the “Full feature set” (as opposed to the “Extended feature set”), which gives you plenty of tools and Bible data to play with. I think most of my examples here rely on features that are available at the Bronze level. Hi Bikey: I’d recommend starting with Basic, their free version. You can read my thoughts on it here. coupon code OVERVIEWBIBLE7 is not working. . . any hints? I’m not stacking coupon codes, and I’m upgrading my base package (from standard silver to Gold-Bronze bilingual). I contacted their sales support and they say the coupon may have expired or the terms may have changed, but they couldn’t say for sure. is the code still active? I’ve continued to try to make it work. Apparently I get the discount for Verbum base packages, but not for Standard Gold. Interesting . . .
FYI I had to talk to two different sales reps, but they got the coupon to go through as desired. issue resolved. I just wanted to say that I’ve used Logos for decades and can’t live without it (well, I’d probably live, but you get the point). I’m a pastor and I wouldn’t even think about starting work on my weekly sermon or Bible Study without it. I can’t say enough about how much it has enhanced my Bible study and research and writing and meditation. Thanks for this article, spread the word. I have been using Logos (at the time I started – Gramcord) since and during Seminary. I have owned it for a time now and actually regret investing in it. It is constantly “indexing” my Library (or reorganizing it). Like today I was trying I was trying to work on a teaching. It was downloading updates. I cancelled the download and then found out it was doing it anyway. Logos is one of those programs I will not recommend to a brother pastor/teacher. It’s certainly not for everyone, but as someone who needs to sift through a good deal of content and data to make some of these resources, I find it invaluable. I agree with you on your comments, and then some. I have Logos 7, along with thousands of titles. I use the smallest fraction of them–as in perhaps less than 1% of them. Full disclosure, I am a scholar and have taught theology at graduate and undergraduate levels. I’ve found Logos can actually *impede* knowledge of the Scriptures and background sources if not used properly, because it focuses on searching rather than settling down to the hard and time-consuming work of reading and understanding ancient and secondary texts. A friend of mine, a grad student in theology, worked for Faithlife. She told me a colleague there told her she was wasting her time learning Greek because Logos does it all for you. That is a chilling but telling remark. Not only is a grossly inaccurate, but it tells the culture of Faithlife: keep pumping out new versions with more bells and whistles most don’t need and will never use, to keep the company going. I use Logos for Bible study and it is hardly–very. But it doesn’t need more stuff. It just doesn’t. I just ordered Logos8, Platinum. Thank you for your review, it helped to solidify my decision. I already owned Logos7 and use it all the time, but can benefit from putting more time to learn all the features. I would highly recommend the software for anyone who is serious about Bible study. I have a Logos 7 Platinum and was wondering to upgrade to Logos 8 Platinum. Not sure whether it is worth is and whether or not I can use the discount from you to do it? Hey, Alex! Really depends on what you use Logos 7 for. If you preach or teach exegetically—of if you’d just find it handy to be able to build slides using Bible verses, Word study wheels, Greek/Hebrew definitions, and the like, you’ll probably appreciate their Canvas tool. As far as a discount goes, you’ll be able to use my coupon (OVERVIEWBIBLE8) to save 25% on that upgrade, plus you’ll get 5 free books. I have been with Logos since the first CD. I truly believe that Logos Software should not be purchased after purchasing 5,6,7 now 8 upgrades. Every edition comes with new books that are formulated into the search tools so that your past editions and most of your separately purchased books are not searched properly for content. This means that only a select group of books, for that edition are properly searched and displayed. So all the past editions, all the past separate book purchased are not properly used if at all. I have found that E-Sword and Olive tree are better and that same books are normally half the price of Logos charges. I am saddened to write such a negative review. May Christ Jesus bless you and keep you always. That being said, while Logos does support a great many titles, that’s really not the draw for me. The features and datasets are what make it worth my while. If someone just wanted to grow an electronic theological library, I’d encourage them to consider alternatives, too. Hello Jeffrey, thank you so much for the post. I have just one question: Does the Silver edition of the Logos 8 include interlinear old and new testament bibles? Hi, Pablo. No, Silver doesn’t include outright interlinear Bibles, but you can activate their “Reverse Interlinear” feature within English Bibles to see the underlying Greek text. You can also view the English and original-language passages side by side in the Exegetical Guide. Hey Joseph! Thank you for the review! How well does Logos synchronize across platforms? Example: I’m preparing a Sunday School lesson and I begin with a workflow on my PC at home. Then I take my iPad to the coffee shop to hang out with the cool kids. Can I continue where I left off at home? On the way to church I drop my iPad. It’s toast. Can I whip out my trusty Android phone and access the lesson? -and of course, Ryrie’s comments and insights, which covered such things as the cultural aspects of the time. 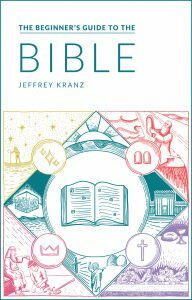 Things like this really brought it all together for me, gave me an overall view of Bible/World history. Does the basic (or any cheaper versions) have things like this? You’d find a few of these in the free Logos Basic, including some infographics and the Faithlife Study Bible notes. But if you bumped it up to the lowest paid package (Starter) you’d get a better timeline feature and a lot more atlas material to play with.